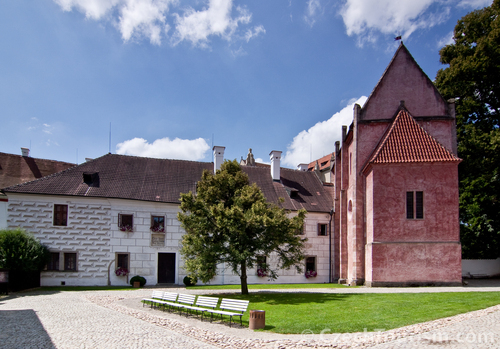 The monastery Zlata Koruna was founded by a king Premysl Otakar II. in 1263. It was originally named Sancta Corona Spinea � the Holy Thorn Crown, because of a relic of a thorn from Christ�s crown that Premysl Otakar II. gave to the monastery. 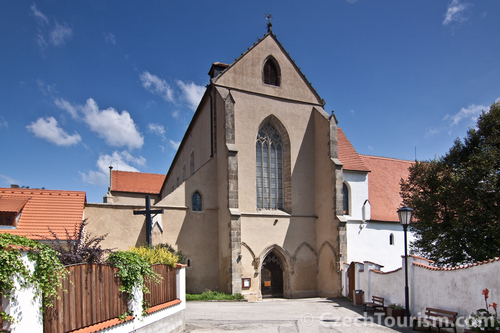 The Cistercians of the most significant Austrian abbey in Heiligenkreutz were called to the Zlata Koruna monastery. The founder also endowed the monastery with huge estate. The Cistercian abbotship should help the king to stop an expansion of the Witigonen, who built a powerful dominion in South Bohemia with a contiguous centre in Cesky Krumlov. The Witigonen demolished the monastery soon after Premysl Otakar II. death in 1276. However, another intensive construction of the monastery was supported by Vaclav II. and during the 14th century the monastery went through its great prosperity. During the Hussite wars the glory of the monastery faded. It was demolished and burned down. Ulrich II. von Rosenberg took over all the estates and power of the Zlata Koruna monastery. The number of monks gradually dwindled. The situation in Zlata Koruna got better as lately as in the second half of the 17th century. The repair of the burnt and waste church started and the baroque remodelling of the monastery was carried out. Under the rule of the last abbot Bohumir Bylansky the Zlata Koruna monastery flowered again. He sorted out the economic situation of the monastery. He founded an observatory and the well known school of Zlata Koruna. The monastery was unexpectedly abolished in 1785 by an emperor Josef II. The property was purchased by the Schwarzenbergs, who rented it to different businessmen. There was for example a bleaching ground, a silk factory, a printed cotton factory and even an iron foundry. Due to industrial activity the monastery dilapidated during the 19th century. The reconstruction started in 1909 and went through during World War II. In 1940 the Gestapo confiscated the Zlata Koruna monastery from the Schwarzenbergs and in 1948 it was confiscated again by the state. Today is the monastery under the administration of the National Heritage Institute. Zlata Koruna monastery is one of the most precious complexes of gothic architecture in middle Europe. The monastery is formed by a three-aisled basilica with the transept. A convent with cloister is annexed to it. On the north of the complex is situated the chapel of Guardian Angels and the so-called little convent is annexed to this chapel. Buildings of the abbey and a brewery are situated further on the north. The convent church was built step-by-step. Its plan comes from 60. or 70. of the 13th century. The first building period finished around 1320. The construction continued probably from the second quarter of the 14th century until the beginning of the second half of the 14th century. The buildings of the convent were built in several periods together with the church. Gothic buildings of the abbey were renovated in baroque style at the turn of 16th and 17th century. Because of the serious devastation in 1420, when the abbey was burnt down by Hussites, the church and the convent were as well extensively reconstructed in baroque style in the second half of the 17th century. 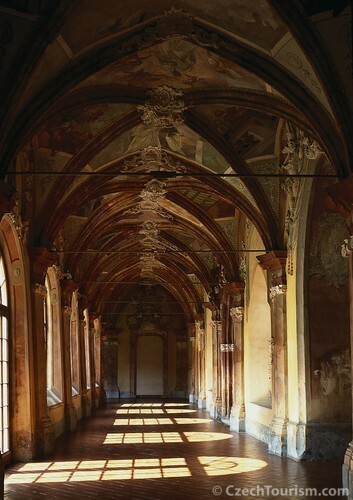 Most of the interiors of the monastery were decorated with Rococo paintings and stucco during the 18th century. The oldest preserved building is the one-floor chapel of Guardian Angels dated around 1370. It is located about 8 km to the north of Cesky Krumlov, in the direction of Ceske Budejovice. A parking place is situated about 300 meters from the monastery on the right side of the river Vltava. It is also possible to reach Zlata Koruna by bus or by train. 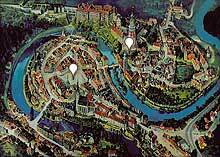 It takes about 10 � 15 minutes from Cesky Krumlov.